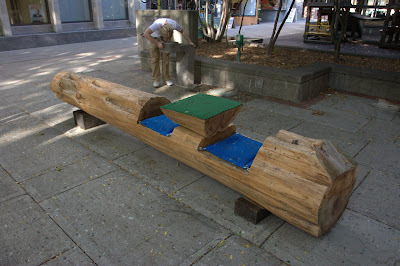 Steve Gallow's Random Photos: Bench of the Week #7, Ithaca Commons, Ithaca NY. The Ithaca Commons is a unique place full of interesting shops, restaurants and public places. I was walking through the commons this week, and I noticed this bench. I thought it was an interesting design, and thought of it as a family bench. I could easily see parents sitting in the blue seats, and drinking their coffee. The coffee could rest on the green table. Meanwhile the children are all crawling all over the rest of the bench like a playground. Photo details: Exposure time 1/60 sec, Aperture f/4.0, ISO 100, Focal Length 17 mm, 35 mm equivalent focal length 28mm, Lens Canon EF 17-40mm, handheld. It is in an excellent location, shady with a good view around. What a unique bench setup! I love it! I now have my Friday bench posted early. O I have never seen a bench like this before - hats off to the designer. I have never seen one quite like this! Someone with an original turn of mind must have come up with the idea. I liked it very much. Wonderful bench. I can see that one in my gardens...or at a cottage in a shady spot...or beside a lake. Beautiful bench. I have not seen one like it.